Though I’m in Rome (and Malta and Napoli for the week), I write for The National Interest tomorrow about the implications of outgoing Buenos Aires mayor Mauricio Macri’s victory in Argentina’s presidential election. 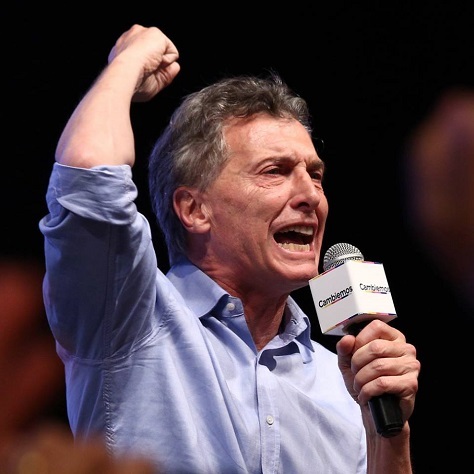 The piece argues that former Buenos Aires mayor Mauricio Macri’s victory (and the first defeat of kirchnerismo since its arrival in Argentine politics in 2003) is a game-changer for Latin American politics for three reasons — by restoring fiscal and monetary sanity to Argentina, paving the way for a wave of pent-up investment; by ending Argentina’s standoff with its creditors and bringing the country back into global debt markets; and by isolating the anti-democratic populist left, including Venezuela, where questionable and unfair legislative elections will take place Dec. 6. Opposition presidential candidate Mauricio Macri and María Eugenia Vidal, now governor-elect of Buenos Aires province, celebrate on the night of the August primaries. When Daniel Scioli emerged on Sunday night to declare victory in the first round of Argentina’s presidential election, it was clear that he did not expect to win the presidency outright and that he would face a runoff — even though no official election results were yet announced. When the first results finally came at around 11 p.m., they showed a far closer race than anyone predicted. At one point, Scioli’s rival, outgoing Buenos Aires mayor Mauricio Macri, was actually leading Scioli. Ultimately, Scioli narrowly won the presidential election’s first round, but Macri’s support was so unexpectedly strong that he now enters the presidential runoff campaign as the odds-on favorite to end 12 consecutive years of kirchnersimo. At stake in the presidential showdown is the legacy of one of the most important bastions of Latin America’s populist, statist left. Macri, the candidate of the center-right Cambiemos (Spanish for ‘Let’s change’) coalition, has gradually expanded a political movement that was once limited to just the most affluent corners of Argentina’s capital. The son of an Italian immigrant, Macri joined his father’s business in the automobile sector before becoming the president of the popular Boca Juniors football club. 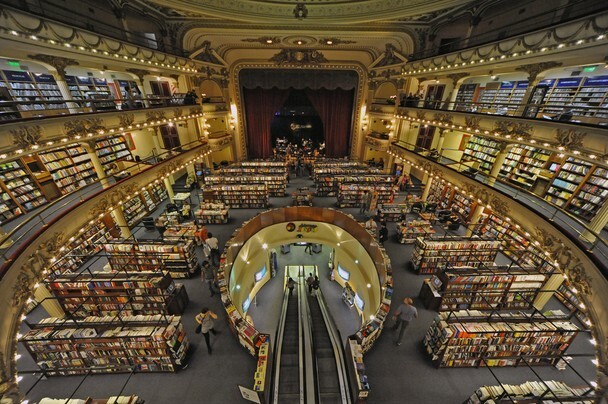 He first entered politics in 2003, waging a failed run to become mayor of Buenos Aires. 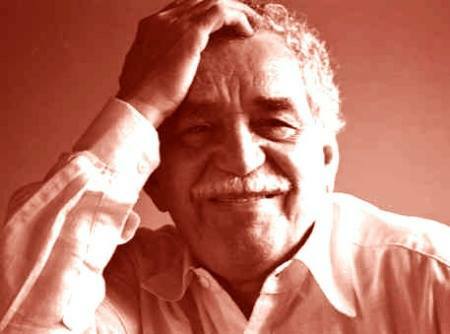 He lost that race, but he used the experience to form a new urban, liberal political party, Propuesta Republicana (PRO, Republican Proposal) in 2005 and, two years later, he won the mayoral election. 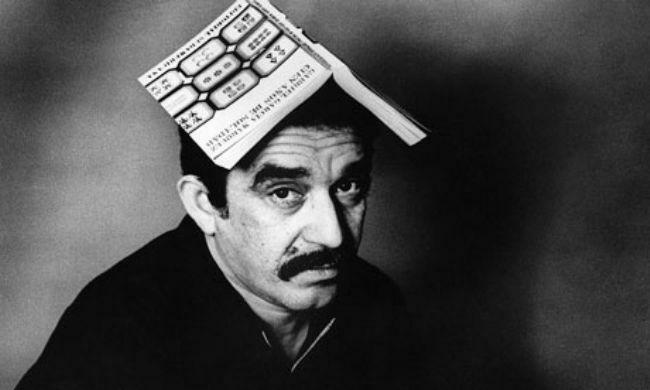 As the standard-bearer of the Cambiemos coalition, he merged his own Buenos Aires-based movement with the Unión Cívica Radical (UCR, Radical Civil Union), a long-lived liberal party that has stood as a contrast for decades to the dominant left-wing populist peronismo. Most voters believe that Macri is the candidate most likely to lift capital controls and bring Argentina back into global debt markets, even if it means a peso devaluation and strong measures to tamp down inflation. Nevertheless, with economic neoliberalism still widely discredited after the economic crisis of 1999-2001, Macri has taken efforts to reassure that he will not subject the Argentine economy to immediate radical change, and he’s even gone out of his way to praise the values of peronismo. Despite doubts, the Macri campaign’s plan seems to be working. He swept the city of Buenos Aires, along with the provinces of Mendoza, Córdoba, Santa Fe and Entre Rios in Sunday’s vote. 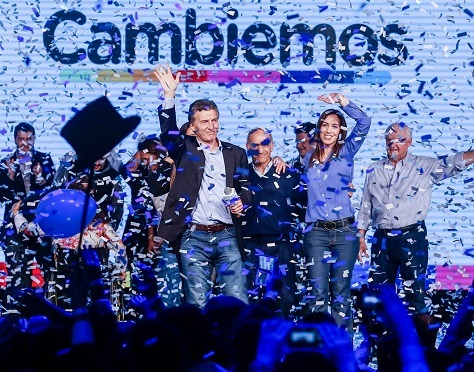 His success in Sunday’s general election took Argentines somewhat by surprise. When election day began, it was conceivable that Scioli, a former vice president and currently the governor of Buenos Aires province, might have scored a first-round victory in the presidential race. He boasted the support of outgoing president Cristina Fernández de Kirchner and the governing Frente para la Victoria (FpV, the Front for Victory), an electoral coalition anchored by Argentina’s peronista ‘Justicialist’ Party. 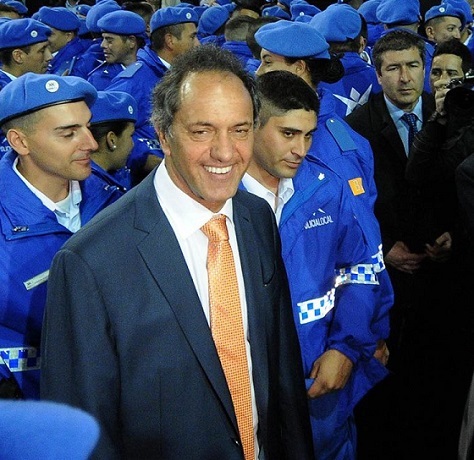 A former motorboat racing star, Scioli took a lead in polls early in 2015, and he’s consistently held an advantage to become Argentina’s next president. Despite rampant inflation, health scares, political intrigue and a slowing economy, Kirchner’s approval ratings have generally improved over the course of the last year — so much so that everyone expects her to try to return to the Casa Rosada in the 2019 election. Most recently, in Argentina’s compulsory open presidential primaries on August 9, Scioli won 38.4% of the vote versus just 30.1% for Cambiemos. A surprisingly tighter race than expected for Argentina’s presidency is making it more likely that frontrunner Daniel Scioli will win outright in the first round on Sunday, October 25. 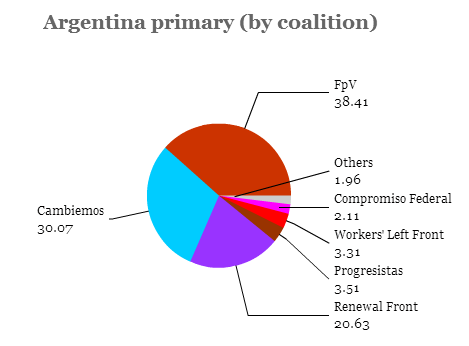 Back in August, Scioli, the outgoing governor of Buenos Aires province and the presidential nominee of outgoing president Cristina Fernández de Kirchner and the governing Frente para la Victoria (FpV, the Front for Victory), demonstrated his strength by winning around 38.5% of the vote in Argentina’s somewhat unique ‘open primary’ contest. His nearest contender was Mauricio Macri, the more conservative and economically liberal outgoing mayor of Buenos Aires, who is leading a broad center-right coalition called Cambiemos (which loosely translates as “Let’s change”), which won about 30% of the vote (including the other challengers who competed with Macri for the coalition’s presidential nomination). Far back in third place was Sergio Massa, one of Kircher’s first cabinet chiefs, now the mayor of Tigre and the leader of an alternative peronista group, the Frente Renovador (FR, Renewal Front), which won just 20.5% of the vote. A one-time frontrunner after leading his new group to the top result in Buenos Aires province during the 2013 midterm elections, Massa’s appeal seems to have stalled through 2014 and earlier in 2015. His electoral alliance choices turned out to be weaker than expected, and he lacks the voter base that both Scioli (as leader of Argentina’s most populous province) and Macri (as leader of Argentina’s capital city) can boast. Moreover, as Kirchner’s approval ratings improved over the course of 2015, so did Scioli’s standing, as he won back disaffected peronistas who might otherwise be tempted to join Massa’s alternative group. 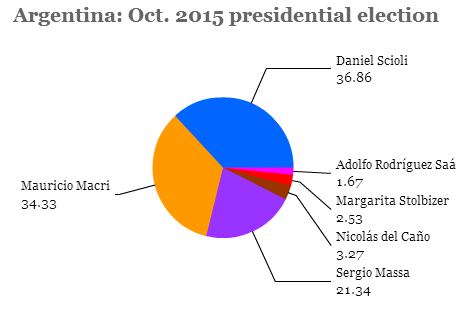 Since August, Scioli continues to lead the pack, while the movement in the race has come in the battle for second place — most polls are now showing that Macri is losing votes and that Massa is gaining. There are many potential reasons. It could be that Argentines feel that Macri is still too close, ideologically speaking, to the economic neoliberalism of the 1990s that many voters feel was responsible for destroying the economy in 1999-2001. It could be that Macri has been tarred by association with Fernando Niembro, a businessman who had been one of the coalition’s leading congressional candidates from Buenos Aires until suspending his campaign in September following an indictment on money laundering charges. That connection has made it hard to argue that Macri will make doing business in Argentina more efficient, transparent or graft-free. Despite Daniel Scioli’s seemingly easy rise over the course of 2015 to become the frontrunner for the Argentine presidency after the October 25 general election, the most persistent criticism he faces is that he will not be his own man in office, but instead a puppet — or even a placeholder — of Cristina Fernández de Kirchner. 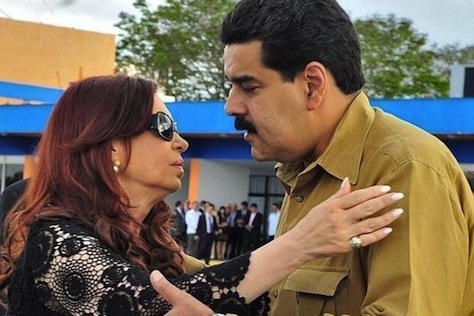 Term limits are forcing Kirchner to step down, after eight years in office that followed four previous years when her late husband, Néstor Kirchner occupied the Casa Rosada. This year’s election will be the first since 1999 when a Kirchner hasn’t been on the ballot, and there’s already plenty of speculation that Scioli is just a transitional figure designed to bridge two eras of kirchnerismo. There’s probably something to those rumors. Kirchner herself succeeded her own husband, in what was widely discussed as a plan to pass the presidency between the two (a plan that went sideways when Néstor died in 2010). If her party had won a two-thirds majority in the 2013 midterm elections, it was entirely plausible that they might have amended Argentina’s constitution to provide her a path to a third consecutive term. There’s nothing necessarily nefarious about Kirchner’s plans, if true, to return to the presidency in 2019. In Latin America, where executive-strong governments are often checked by strict term limits (in many cases, presidents are limited to a single consecutive term), it’s not unusual for popular former presidents to return to office. That’s currently true for two of Argentina’s neighbors — Uruguay reelected left-wing Tabaré Vázquez to the presidency last December after a four-year stint out of office; Chile did the same, where the center-left Michelle Bachelet returned to office, after an equal four-year break, in December 2013. Despite (or perhaps because of) the sinking popularity of Brazilian president Dilma Rousseff, a widespread corruption scandal and a tough economy, the widely-loved Luiz Inácio Lula da Silva is openly considering a run in the 2018 election after eight years out of office. Even in the United States, it’s still a good bet to assume that the wife of a former president will face off for the presidency in 2016 against the son and brother of two other former presidents. There’s some bit of good news for each of the three contenders battling to win the Argentine presidency on October 25 after Sunday’s primary contest. Daniel Scioli, the governor of Buenos Aires province, ran unchallenged for the nomination of the governing ‘Justicialist’ Frente para la Victoria (FpV, the Front for Victory) of Cristina Fernández de Kirchner, and the bloc won nearly 38.5% of the vote. Mauricio Macri, the more center-right chief of government of the city of Buenos Aires, easily won the nomination of the three-party Cambiemos coalition, with over 24% of the vote nationally. Sergio Massa, the one-time frontrunner, former Kirchner cabinet chief, Tigre mayor and leader of the peronista, if not kirchnerista, Frente Renovador (FR, Renewal Front), easily won the nomination of his own coalition, with over 14% of the vote. When you add together the votes for the coalitions, Macri can expect to enter the final campaign sprint with something more like 30% to Scioli’s 38% — with Massa’s coalition winning around 20.5%. 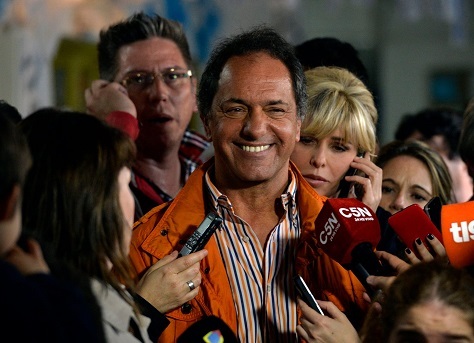 There’s no doubt that Scioli’s success demonstrates a perhaps surprisingly united Argentine left, with reform-minded voters pulling away from Massa and towards Scioli (pictured above). Despite a scandal-plagued year, Fernández de Kirchner’s approval ratings are on the rise and, although inflation and other economic woes still plague Argentina, the economy is generally doing much better than neighboring Brazil or Chile and, in any case, better than in 2013 and 2014. 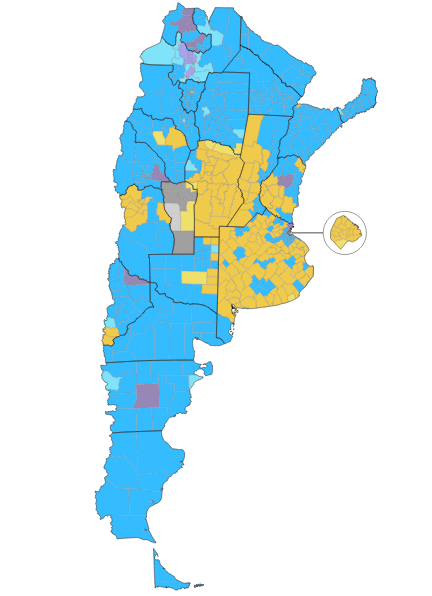 Unlike his opponents, Scioli benefits from a truly national political network, which was clear on Sunday — the FpV won more votes in all but three provinces. As the governor of the country’s most populous province, he currently serves 16.3 million of Argentina’s 41.5 million-strong population. Moreover, Fernández de Kirchner and the current government will be doing everything in its power to bolster Scioli’s chances in the next two months. Though she cannot herself run for reelection, Fernández de Kirchner’s close ally Aníbal Fernández (currently chief of cabinet) narrowly defeated Julián Domínguez in the hard-fought primary to win the FpV gubernatorial nomination for Buenos Aires province (and to success Scioli). Furthermore, Fernández de Kirchner is believed to have influenced Scioli to appoint as his running mate Carlos Zannini, a Kirchner loyalist and the presidential legal secretary since 2003. The fortunes of Zannini and Fernández mean that Fernández de Kirchner will wield strong influence in any Scioli administration. Nevertheless, Scioli’s allies worry that he will be forced into a November 22 runoff against Macri. Scioli’s 38.41% support is a bit short of the 45% he will need on October 25 to win the presidency outright (alternatively, he could win with 40% of the vote so long as he defeats his opponent by at least a 10% margin). The primary results suggest that, barring a massive turn among Massa’s supporters to the ruling party, Macri will get a chance to take on Scioli directly. Since 1983, the end of a brutal seven-year military junta, no presidential election has advanced to a runoff. On August 9, Argentine voters will take part in a compulsory open primary — the dress rehearsal for the general election set for late October. 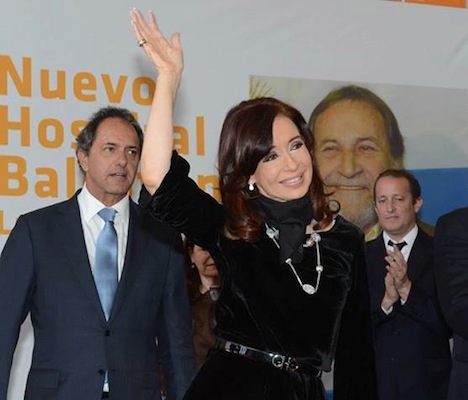 It’s the first presidential election since 1999 where a Kirchner won’t actually be on the ballot. Nevertheless, kirchnerismo is very much on the ballot, and its standard bearer, Daniel Scioli, the candidate of the ruling Frente para la Victoria (FpV, the Front for Victory), served as the late president Néstor Kirchner’s vice president between 2003 and 2007. The country’s pre-game primary, however, is a relatively new feature to Argentine democracy. 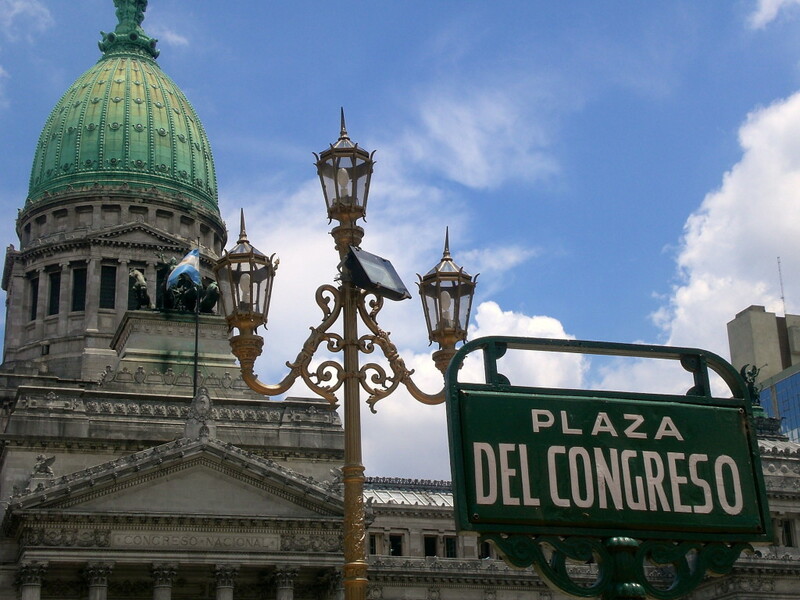 The outgoing incumbent, Cristina Fernández de Kirchner, introduced open primaries in time for the 2011 elections — mandatory for both parties and voters alike. Candidates must win at least 1.5% support in the primary to advance to the general election. In a country where polling is still more art than science, and where political parties and coalitions are still more personality-oriented than long-term ideological vehicles, the primary is the most reliable test of electoral support before the October 25 election. If polls remain as tight as they are today, and no candidate wins (i) either 45% of the vote outright or (ii) at least 40% of the vote (and leads the nearest candidate by more than 10%), the country will choose between the top two finishers in a November 22 runoff. In one of the most important tests before Argentina’s general election, the hand-picked successor of outgoing Buenos Aires mayor Mauricio Macri, the chief center-right presidential candidate, only narrowly won a July 19 mayoral runoff. Just three weeks out from Argentina’s crucial national presidential primary, the Buenos Aires mayoral results are being reported as a drag on Macri’s presidential campaign, and that’s true — to a degree. 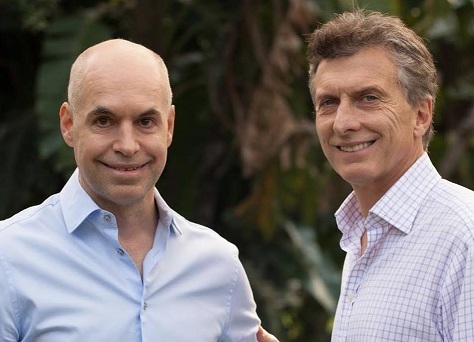 Macri’s long-serving chief of cabinet, Horacio Rodríguez Larreta (pictured above, left, with Macri, right), garnered just 51.6% of the vote in a two-way race he was once expected to win easily by a double-digit margin. So while Rodríguez Larreta’s victory extends a three-term governing streak for Macri’s conservative Propuesta Republicana (PRO, Republican Proposal), it fell too far short of expectations. After all, Buenos Aires is the PRO’s heartland — Macri’s reach barely extends beyond the city to the larger Buenos Aires province, let alone the rest of the country. With an open presidential primary taking place on August 9, however, and the October 25 presidential and parliamentary elections following shortly thereafter, the city’s mayoral election was a key test for Macri, who is trying to succeed Cristina Fernández de Kirchner, herself term-limited from seeking reelection. Macri essentially occupies the conservative side of the presidential campaign — he hopes to win by picking up support from Argentine moderates and disenchanted kirchneristas without seeming too neoliberal. The winner of the 2015 election will be the first president in 12 years not to be a member of the Kirchner family, and Argentine voters may be ready for a modest change after the 21st century version of peronismo, as personified by the late Néstor Kirchner and his wife, Cristina Fernández de Kirchner, who hopes to guide the ruling Frente para la Victoria (FpV, the Front for Victory) to yet another term. Macri, for his part, wants to contrast the strength of his eight-year stewardship of the relatively wealthier city against the record of the FpV’s 2015 presidential candidate, Daniel Scioli, since 2007 the governor of the surrounding (and more impoverished) Buenos Aires province, and of Tigre mayor Sergio Massa, another center-left peronista who broke in 2013 with kirchnerismo to form the Frente Renovador (FR, Renewal Front). 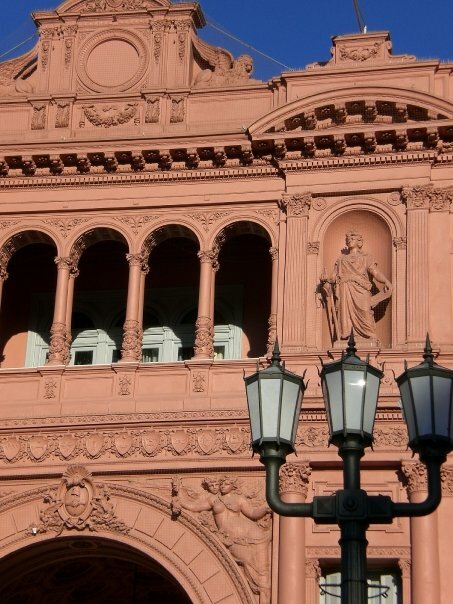 It’s no surprise, by the way, that three politicians from the Buenos Aires region are vying for the presidency — the city, an autonomous federal district, together with the Buenos Aires province, is home to nearly 50% of Argentina’s 41.5 million citizens. 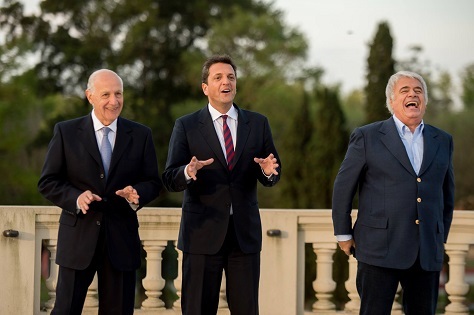 All three candidates — Scioli, Massa and Macri — have indicated they would pursue a more investment-friendly administration, and Macri, in particular, benefits from heading the most business-friendly government during the Kirchner era. Macri nevertheless emphasizes that he’ll introduce only gradual shifts in policy, lest voters worry he’ll return to the economic policies of the disastrous 1990s. Presumably to win Fernández de Kirchner’s support, Scioli last month named as his running mate Carlos Zannini, a fierce Kirchner loyalist who has served as the president’s legal secretary since 2003. But Scioli has emphasized that he wants to remove, however slowly, the capital controls of the Kirchner era, and to govern in a less interventionist and inflammatory manner. Massa has positioned himself in between Scioli and Macri and, though his poll numbers seem to have dipped, seemed like the wide frontrunner following his breakout performance throughout Buenos Aires province in the October 2013 midterm elections. While there are a lot of reasons why Macri could still lose the presidential race, it’s not particularly clear that either Scioli and the governing FpV or the upstart Massa should take too much comfort from the Buenos Aires mayoral election. 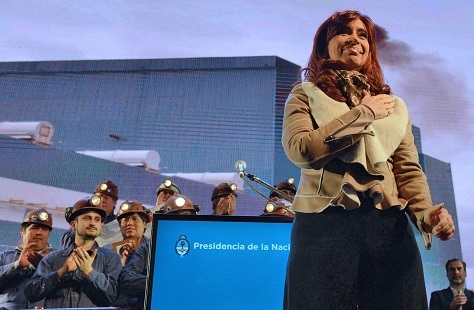 It ultimately took an American hedge fund to unite the Argentine people behind the increasingly unpopular presidency of Cristina Fernández de Kirchner. Now, after a prolonged fight that has its roots in Argentina’s last debt default over a decade ago, a fight that has weaved its way through the corridors of power in Buenos Aires, via the banks of New York and London, into the highest court of the United States, and with consequences that will reverberate from Brasília to Caracas, Argentina is now defaulting, once again, on its debt obligations. How did Argentina end up in this situation? And what will happen if Argentina, which technically entered default at midnight earlier today, doesn’t arrive at a deal with its creditors? I discussed the dual economic crises in Venezuela and Argentina today on SiriusXM’s Cristina channel on ‘From Washington Al Mundo’ with Mauricio Claver-Caroné. It was an absolute pleasure — and Suffragio readers should check out the entire program on SiriusXM. 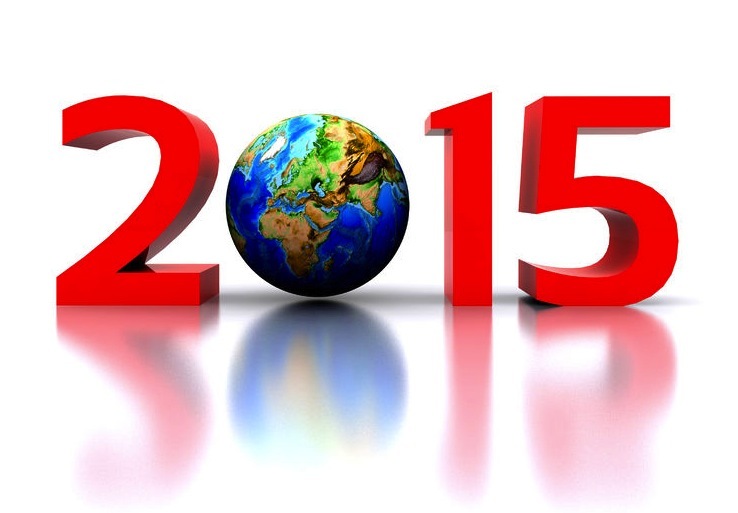 But in the meanwhile, here’s the audio from my segment. The segment picks up from my piece last week in The National Interest, which tracks the similarities between the economic crises in both countries, but also the other similarities in their politics, their history, and the way that past governments handled neoliberal economic reform in the past. So there are a lot of common threads that go beyond basic macroeconomic coincidences to the cultural, political and historical. I also noted today that it seems like Argentina is a half-step or so behind Venezuela in terms of its economic crisis. It’s only just now starting to feel the real crunch of a dollar shortage. The headline this week is about a ketchup shortage, and that’s the kind of headline that featured in Venezuela last year — shortages of everything from toilet paper to holy water. Anyway, please do check out the audio if you’re interested — I’ve only started to do television and radio interviews, so I’m learning as I go. 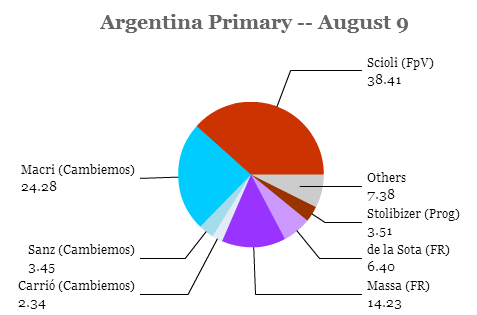 The big story from the Argentine midterm elections is the rise of Sergio Massa as the frontrunner for the 2015 presidential election and the likelihood that the era of kirchnerismo is coming to an end. The fact that Argentine president Cristina Fernández de Kirchner has been absent from the campaign trail following emergency brain surgery earlier this month, which followed her party’s weak showing in August’s open primaries, only seemed to amplify the narrative that her presidency is entering its lame-duck phase. But amid the hype over Massa’s rise and the curtail calls for kirchnerismo, it may have escaped attention that Fernández de Kirchner’s ruling Frente para la Victoria (FpV, the Front for Victory) actually won Sunday’s midterm congressional elections. It helped that the Front for Victory was defending just 38 seats in the midterms, which certainly limited exposure and potentially greater losses for the kirchneristas. But make no mistake — Fernández de Kirchner and her allies will continue to control Argentina’s legislative branch for the final two years of her presidency, even if it will become trickier to pass bills into law. 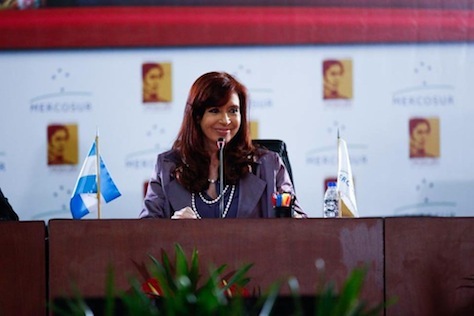 Even before her latest health scare, Argentine president Cristina Fernández de Kirchner was appearing increasingly like a lame-duck president. Prevented from running for reelection under the two-term limit in the Argentine constitution, Kirchner’s ruling Frente para la Victoria (FpV, the Front for Victory) was already struggling in midterm elections that will determine nearly half of the Argentine legislature. But Fernández de Kirchner was rushed to the hospital for emergency surgery to remove blood from the surface of her brain, which followed a previously undisclosed subdural hematoma suffered after the president fell in August. She was instructed by doctors to rest for 30 days, all but guaranteeing that the leading figure in Argentine politics would be on the sidelines as the country votes. That might actually be good for the FpV’s chances, given the unpopularity of kirchnerismo these days — a decade after her husband Néstor Kirchner first won election, Fernández de Kirchner leads a government that’s struggling to stop inflation, slow rising crime and turn around a weakening economy. The Argentine government’s dysfunctional exchange rate policy has led to the emergence of a black market for US currency. 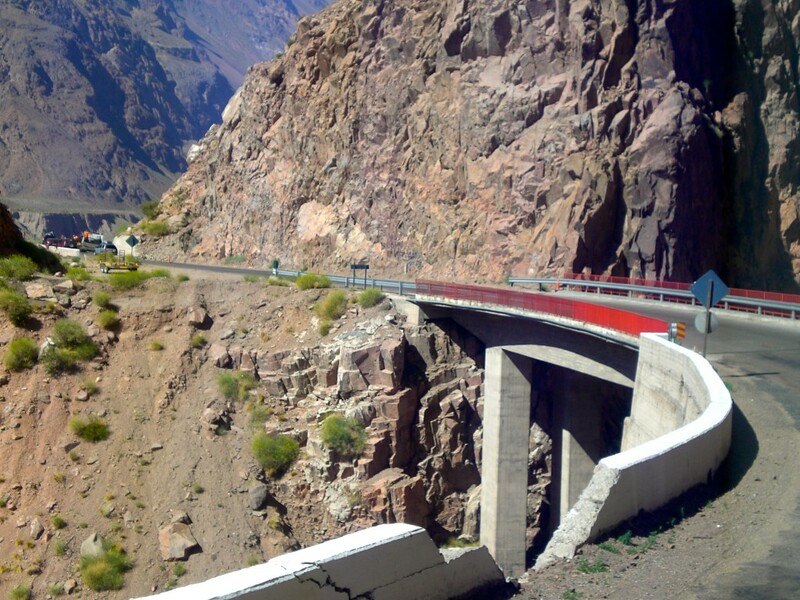 Moreover, Fernández de Kirchner is still battling some of the holdout creditors from Argentina’s 1999-2001 debt crisis even as Argentina remains shut out from capital global markets, which has left the Argentine treasury sometimes grasping for liquidity. Meanwhile, her former ally Sergio Massa is leading the charge against her in the province of Buenos Aires, by far the largest province in Argentina (it’s home to 15.5 million of Argentina’s 41 million residents). Massa, also a center-left peronista, served as the chief of the cabinet of ministers from 2008 to 2009 before winning election as the mayor of Tigre. But he’s broken with Fernández de Kirchner in the midterm elections, and he’s founded a rival entity, Frente Renovador (Renewal Front). As Tigre mayor, he’s focused on crime prevention, and as he looks to the national stage, he’s also emphasized reducing crime and corruption. As a peronista alternative to kirchnerismo, Massa has defined himself as a business-friendly, center-left candidate, who’s embraced the push for greater social and economic justice over the past decade, but who prefers a less unorthodox approach to economic policy. Massa’s Renewal Front defeated the Front for Victory in August’s open primaries — a sort of dress rehearsal for the actual midterm elections — by a margin of 35.1% to 29.7%, a gap that could grow on Sunday as Massa’s popularity has grown. 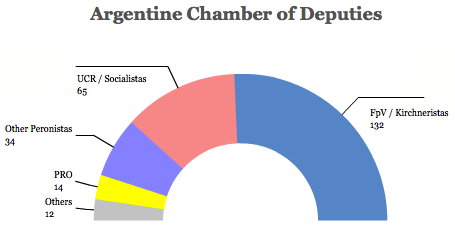 Argentines will choose determine one-half of the composition of the 257-member Cámara de Diputados (Chamber of Deputies) of the lower house of the Argentine National Congress and one-third of the composition of the 72-member Senado (Senate), the upper house. 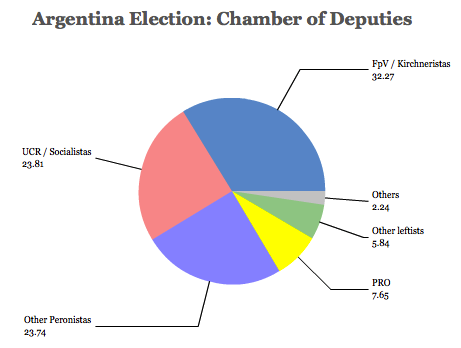 Due to the staggered nature of elections, and the fact that the Argentine opposition did much better in the 2009 midterm elections than in the 2011 general election (when Fernández de Kirchner easily won reelection), the FpV will only be defending 38 of its 116 seats in the Chamber of Deputies. So there’s still a wide chance that the kirchneristas will still control the legislative branch of government — in any event, the FpV will almost certainly remain the largest party in the Congress, and because of the regional nature of Argentina’s many opposition parties, the FpV will still probably win the largest number of votes in the October 27 midterms, notwithstanding its unpopularity.